Commuters moving under the “lens” complete the passive kinetic effect by being in and seeing their reflection in the panels, becoming part of the ever-changing atmosphere above. Strategic skylights align with solstice and equinox sun angles channel light two levels down into the depths of the station, kinetically illuminating a typical daylight-starved space. 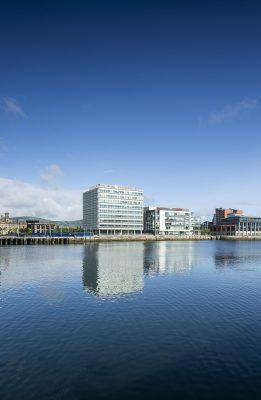 The completion of City Quays 2 marks the latest addition to Grimshaw’s commercial development portfolio with a building in the heart of Belfast Harbour in Northern Ireland. UK’s highest honour for architecture is approved personally by Her Majesty The Queen, awarded for his sustained contribution to architecture in the UK and globally. 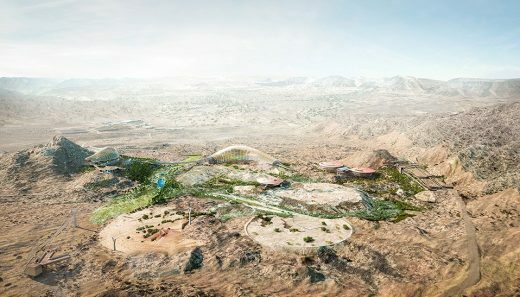 Grimshaw has been appointed for a new botanical garden in Sharjah, UAE, which has a mission to encourage discovery and education while conserving the rich floral heritage of Sharjah, the UAE and the rest of the world. Grimshaw has transformed the Meat Market in North Melbourne into a giant installation that literally wraps around the events at the hub for Melbourne Knowledge Week (MKW18), the City of Melbourne’s annual festival which explores the smart and innovative future of Australia’s fastest growing city. The buildings, along with the garden site, have been designed to achieve the globally recognised sustainable standard, LEED Platinum. 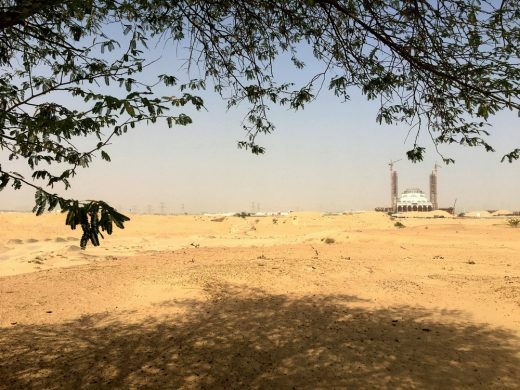 With water such a precious resource, particularly in the region, Arup has developed a strategy for the irrigation and water features. Water is sourced sustainably and not a single drop is wasted. Grimshaw is pleased to announce the opening of the Phillip and Patricia Frost Museum of Science (Frost Science) in Miami, Florida. This exciting new 250,000 square foot facility brings together an aquarium, planetarium and science museum onto one campus in downtown Miami’s Museum Park. Appointed by Amtrak, this design team is pleased to announce the advancement of the Concourse Modernization project at Washington Union Station. 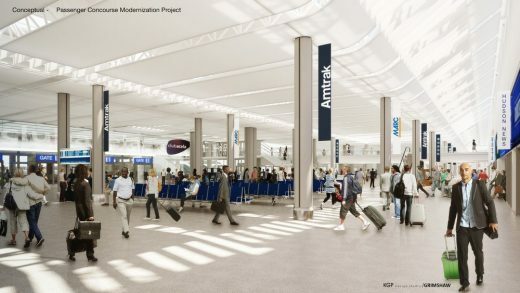 This near-term comprehensive renovation of Washington Union Station’s intercity and commuter rail concourse will add approximately 20,000 square feet (1,900 sq m) of new passenger space. Planning Consent granted for the Nine Elms Over Site Development in a unanimous decision. 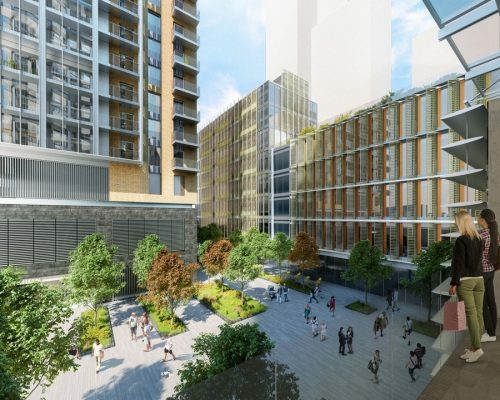 Four key buildings are contained in the design: three of which will be residential with a minimum of 25% affordable rental housing, built over Nine Elms Underground Station. The fourth building will comprise commercial office and retail spaces. 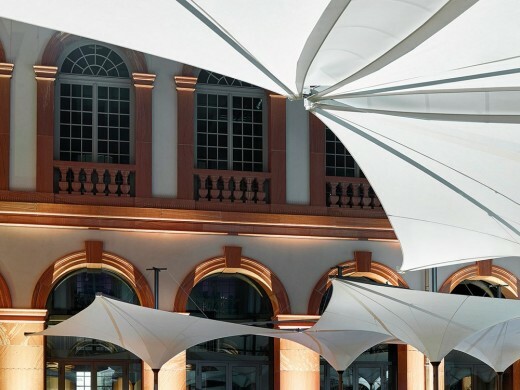 A successful collaboration between architects and tensile designers reached its final stage last week at Frankfurt’s Light + Building festival and trade fair, where MDT-tex launched the final Tensilation Type EV canopy system. 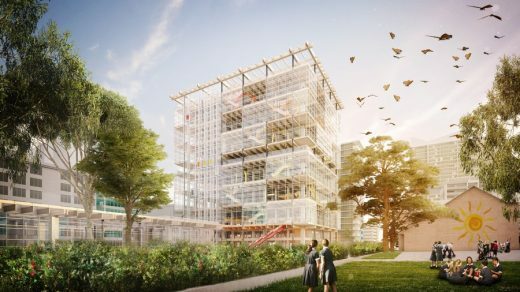 The first high-tech, high-rise public school is to be built in Australia’s New South Wales, through an investment of more than AUD 100 million. 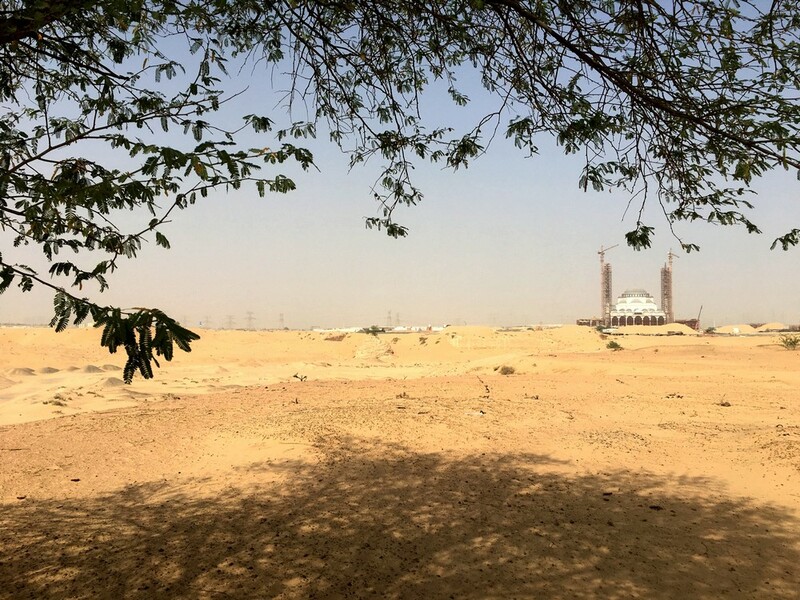 Global construction consultancy Turner & Townsend is to provide full cost management services and advisory for this project. The architects office worked closely with the developers of the building, Mirvac, and major tenants, AGL, to deliver an A-Grade office space that is designed to take best advantage of the unique over-rail air-rights site. 15 Oct 2013 – Following a competitive interview process Grimshaw, in partnership with Nordic Office of Architecture, has been appointed by the Turkish consortium of Cengiz, Mapa, Limak, Kolin and Kalyon to design the terminal complex for Istanbul New Airport. Located on the Black Sea coast, some 35km outside of Istanbul, the ambitious six-runway development, masterplanned by Arup, will be delivered in four phases. The first phase will open in 2019 and aims to serve 90 million passengers per year. This will increase to 150 million passengers per annum once fully complete. The new airport will include the world’s largest airport terminal, with a gross floor area close to one million square metres. This 30,000sqm extension to the existing shopping centre building is the first retail centric project by the British architects practice since their acclaimed Sainsbury’s building in Camden, London. 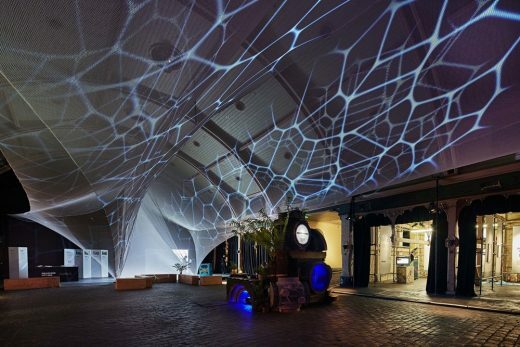 The architects “challenged existing retail perceptions by breaking down the traditional inward-looking approach. 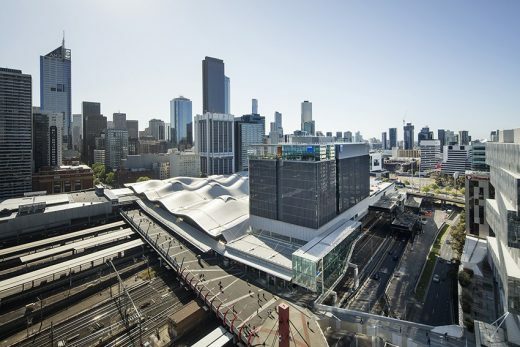 Importantly, the new Highpoint creates a vibrant public realm with strong connections to the surrounding environment, landscape and community”. The second phase of the Grimshaw designed Reading station redevelopment opened to passengers last week. Five new platform faces and a new transfer bridge were unveiled on Tuesday 2nd April, making interchange at the station simpler, quicker and easier. The Grimshaw designed Stoke on Trent City Centre Bus Station will officially open to the public on Tuesday 26th March. 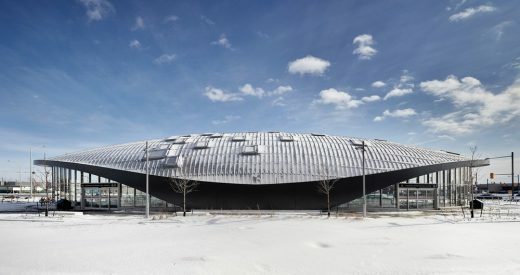 The architects won an international design competition for this building back in 2010. The project forms a significant step in the city’s redevelopment plan. 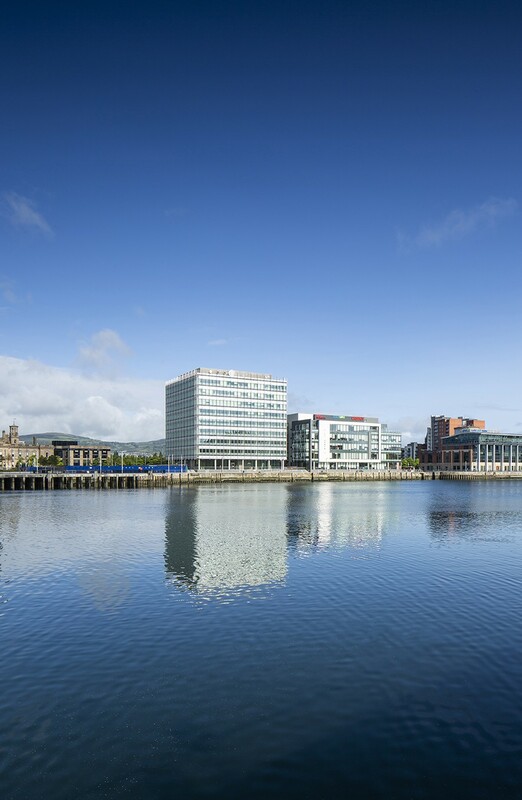 Situated on a prominent site on the boundary of the city centre alongside the ring road, the scheme offers spectacular distant views, whilst the character and landscape of its location has been a strong source of inspiration for the design. Architects Grimshaw have today unveiled an ambitious and attainable proposal to address the aviation capacity issues facing the South East of the UK. ‘London: Hub City’ focuses on London’s position as one of the world’s most vibrant commercial and cultural centres. It argues that the capital should be made accessible to travellers, including those using London as a ‘hub’ to reach other parts of the world, to an unprecedented degree. Grimshaw is delighted to announce that it has completed a detailed masterplanning study for Fraport which provides a new vision for the existing forecourt area at Frankfurt Airport’s Terminal 1. 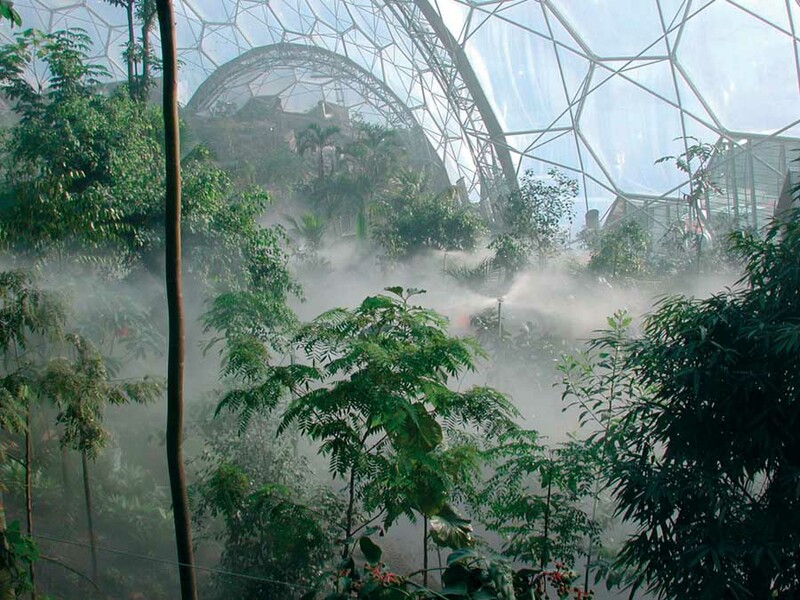 Grimshaw’s defining concept for the masterplan is to bring light, greenery and fresh air into the heart of the airport. The current forecourt at Frankfurt Terminal 1 is a kilometre long strip of private and public transport modes, that has no sense of order and no respite from the noise and fumes of associated vehicles. This South Bronx building is a “revolutionary mixed-use, mixed income residential development” according to the architects. The project showcases high-quality innovative green design while also providing affordable housing for low and moderate income households. 7 Sep 2012 – Grimshaw has won the contract to design a new £10 billion nuclear power station at Sizewell, in Suffolk, south east England. The Los Angeles County Metropolitan Transportation Authority (Metro) Board of Directors approved LA-based Gruen Associates, in association with Grimshaw Architects, as the consultant team for the creation of a masterplan for the historic Union Station and its surrounding 40 acres. Metro CEO Art Leahy was authorized by the board to execute a firm fixed price contract not to exceed $4,150,000. 13 Jun 2012 – Grimshaw is pleased to announce their appointment to transform Duke University’s West Campus Union in Durham, North Carolina. Built in 1931, the West Campus Union was once the social center of the west campus at this prestigious academic institution. Duke University hopes to modernize the prominent historic building and re-establish it as the epicenter of west campus student life by reorganizing existing layouts and adding features that promote a healthy and dynamic campus culture. Inspired by the close-knit Duke community, the scheme will provide spaces where faculty, students, staff, and alumni can meet one another, for either planned or impromptu interactions. The design aims for careful attention to sustainability and intelligent use of resources that will reinforce Duke’s holistic approach to student lifestyles and well-being. 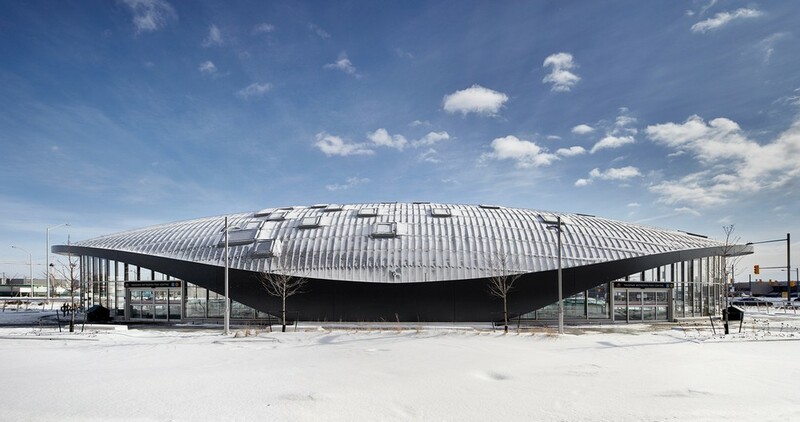 This architecture practice will embark on a sensitive integration of new contemporary architecture in harmony with careful preservation of the historic structure. The project will expand dining facilities into a multi-venue space with additional capacity for learning facilities and events. 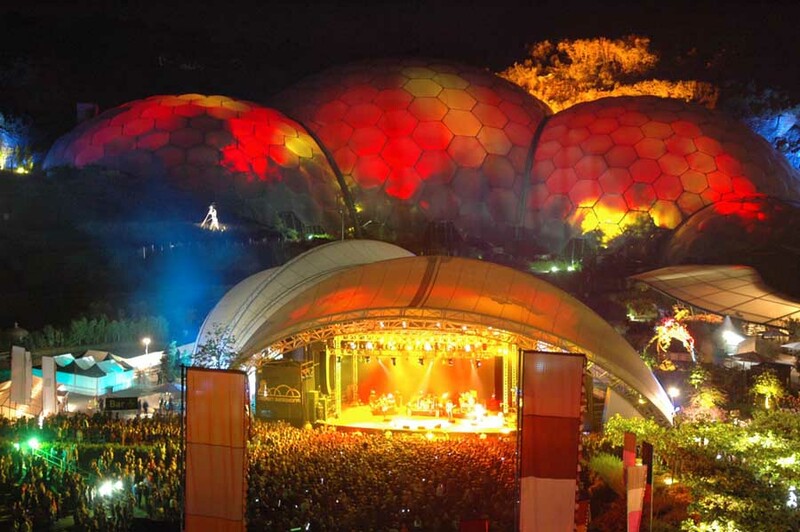 Innovative energy and engineering solutions will work in concert with programming development to deliver a solution that sustains the natural, social and built environment. 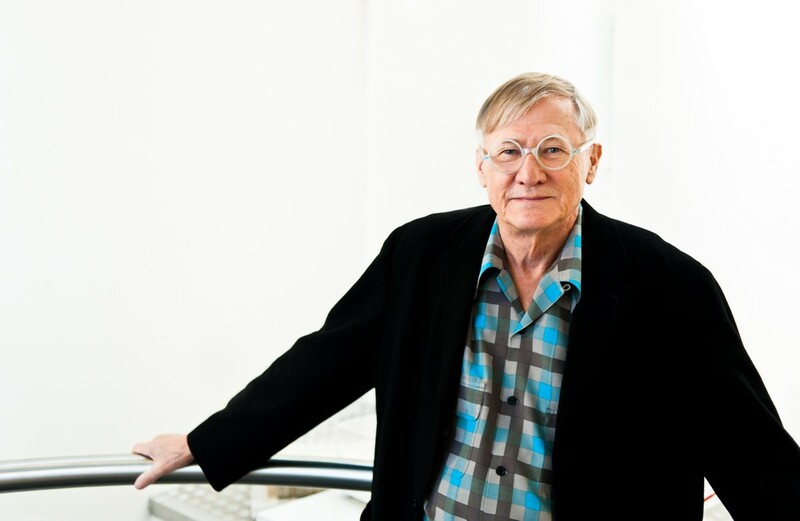 Grimshaw will work with Duke faculty, staff and students to foster spontaneous interaction and clarify circulation while celebrating the union’s original architectural character. The project is poised to establish the West Campus Union as an exciting campus hub for student and community engagement. Construction on the project is expected to begin in the summer of 2013. This architectural practice is the successful finalist selected to masterplan the central Boulevard of Albania’s capital city, Tirana. The other finalist was DAR. This architecture office has won a competition to develop a masterplan for the centre of the German city of Monchengladbach. The architecture practice, in association with local project partners Konrath & Wennemar and FSWLA were selected though an international competitive process to develop a masterplan strategy for the city centre area of Mönchengladbach, Germany. 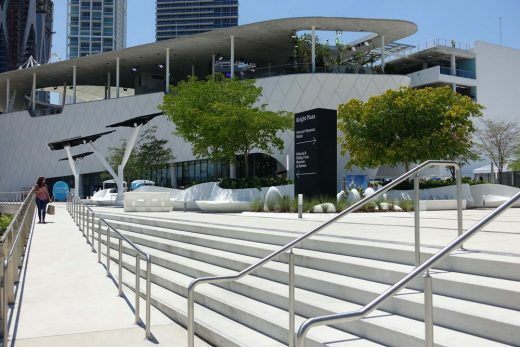 After years of planning and widespread community support, the new Patricia and Phillip Frost Museum of Science today broke ground in Downtown Miami’s Museum Park on the 24th of February. The groundbreaking ceremony took place at the museum’s new site overlooking Biscayne Bay, marking the continuation of Miami’s rise as one of the world’s most culturally rich cities. The groundbreaking event marks the beginning of construction, with the new museum scheduled to open to the public by early 2015. After a competitive selection process Grimshaw is delighted to announce that it has been selected by The All England Lawn Tennis Club to design their “Wimbledon 2020” masterplan for future development requirements. The new masterplan continues the previous ‘Long Term Plan’, which was commissioned in 1993 and completed in June 2011. Shortlisted architects included Amanda Levete Architects, Hopkins Architects, and Walters and Cohen. Dr Joe Spence, the Master of Dulwich College, and his Chairman of Governors, Lord Turnbull, are delighted to have secured the appointment of Grimshaw Architects to work with the College on plans for its science building, including creative reuse of the existing 1950s facilities – Phase 1 of the Master Plan devised by John McAslan + Partners through the early months of 2011. March 9, 2019 in Architects.